All day today on Twitter I was twittering, tweeting, sending twats about the lack of historic perspective in the auto-auto, self-driving, driver-elimination…whatever you want to call this long-time coming vehicle drone industry. “Control system” was all the rage for terminology in the 1960s, I guess. Consistent terminology is hard. Marketing old ideas is too. No one would say control system today, would they? They certainly wouldn’t say auto-auto. The words automobile and automotive already have the word auto built-in. Seems tragic we have forgotten why we put “auto” there in the first place. Auto mobile, not so auto anymore? An old racing friend called this becoming “velocitized”. After you get used to things at a certain speed or way you lose touch. So the word auto is no longer impressive. We need to speed up again or we will start to feel like we’re standing still — need more auto. And so the “auto” industry wants to become automated again but that sounds like failure so let’s come up with a new phrase. Sure history is being obscured but that’s the very problem of people becoming velocitized over time, so someone came up with “self-driving” to get our attention again. Self-driving, aside from being disconnected from auto roots, sounds slightly sour and selfish because if it’s driving you or others around it really isn’t just “self” driving is it? What will conjugations of drone be for future generations? He, she, self-driving? Here comes the self-driving car. There goes the…not-just-self-driving car? They called it the “far-off future of 1976”. No joke. Driverless cars by 1976. Crazy to think about that timeline today. Twenty years is all GM thought they’d need to get cars driving people around without a driver. No wait, I mean driving others around while driving themselves. And it went so far as to back-date the research 7 years promising full use by the far off future of…wait for it…1975! I want you to think carefully about a headline in 1960 that says robotic machines will “eliminate” humans. Hold that thought. 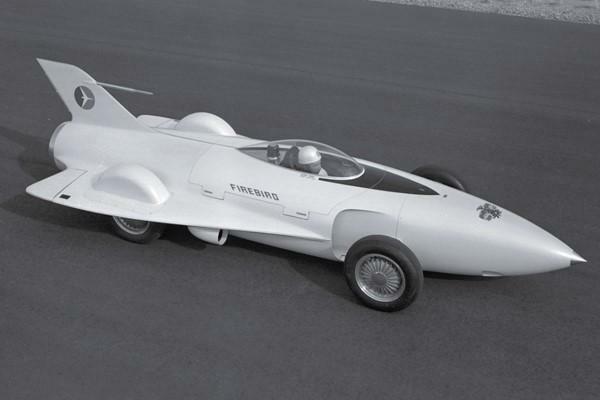 Going back 7 years would be 1953, which sounds like it would be the GM Firebird rocket-car concept with automobile-control-towers to avoid rocket collisions on roads. Thank goodness for humans in those control-towers. By 1964 the idea of automation seemed to still be alive. 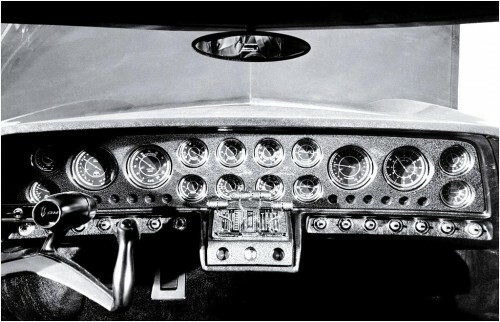 GM’s Stiletto concept had rear-view cameras and ultra-sonic obstacle sensors. Surely those were a mere stepping-stone away from full drone. Or was there a slide backwards towards keeping human judgment in the mix? Take a guess at what happened in the intervening years that might have changed the messaging. If you said “Cuban Missile Crisis” you win a vehicle…that eliminates humans. McNamara then wisely predicted “rationality will not save us”. Odd thing about that guy McNamara, he was a top executive at Ford motor company before he joined the Kennedy Presidential Cabinet. 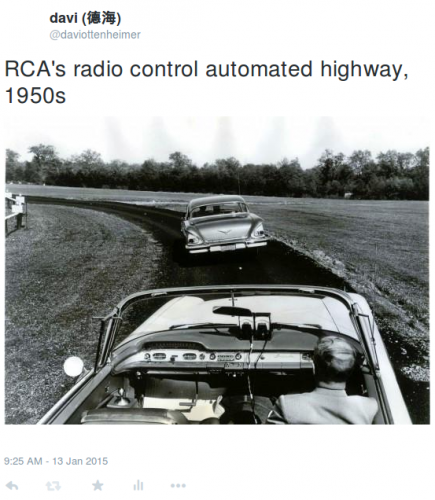 Perhaps it now is easier to see when and why views on automobile automation shifted. 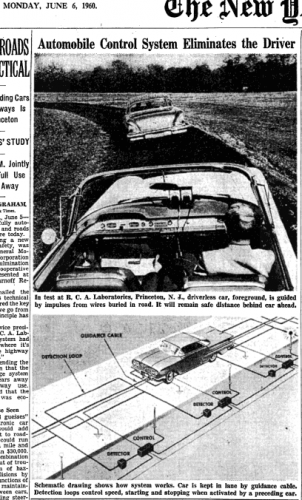 Instead of full-speed ahead to 1974, as predicted, by 1968 you had popular culture generating future visions of 2001 where a self-driving space ship attempts to “eliminate” its human passengers. Spoiler alert: Hal took the term “self-driving” too literally. Moral of this post (and history) is don’t trust automation and choose your automation code words carefully. Beware especially the engineers who re-brand mistakes as being “too perfect” or completely rational, as if they don’t know who McNamara is or what he taught us. Because if you forget history you might be condemned to automate it.